Keyword density is the percentage of times a keyword or phrase appears on a web page compared to the total number of words on the whole web page. First I want to tell that Keyword Density is one of the very important term in SEO, and major impact on your search result. As it seam in its name that how much dense a keyword in your content. The content is not only the text area the you seen in web page, but also it consider all text that is available in your web page its mean, the text in your title tag, meta tag, image alt tag, footer and also text that you show your visitor. Here I want to clear one thing more that every word is in your content is a keyword. Don’t confuse with your keyword that you target only. We often care keyword density only for those keyword that we target. But it is not good we care all words. Google don’t know which keyword you want to target with this page. Google treat every word as keyword, then how Google understand that this is your targeted keyword, and it is clear with the help of keyword density. The keyword have more density is more important for Google. If you want to target “boys sport shoe” but the density is for “sport shoe” is higher the “boys sport shoe” then your ranking is always conflict for “boys sport shoe”. You get top 9 position but it soon come back on second page. You not get stability. Because, Google get confuse about your targeted keyword. Reason is… according to you “boys sport shoe” is your keyword and you work on it but according to keyword density “sport shoe” is targeted keyword for Google. And same thing for all words that are in your content. How much keyword density is good? 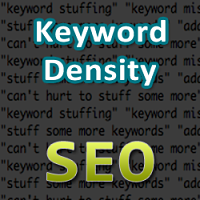 In reality it is very difficult to say that how much keyword density is good. Every SEO expert have their own opinion. According to me 2% is very good and till 3% can be considered. So it is very good if your main keyword have 2% density. And other have less then 2%. What is the formula to get keyword density? Just copy and pest it in your browser and find keyword density easily.